Some conference upsets – both near or at the top of leagues and in the middle – led to a nice shakeup in this week’s rankings. That spreads throughout the top 10 all the way down the whole rankings. We start at the top though where the top three are starting to separate themselves. Once again the Cougars rolled, keeping their unbeaten record going. They’ve also lost just one set dating back to September 13, so over a whole 30 days. Two teams competing for NCAA Tournament bids come to Provo this weekend. The Cardinal are in one of the toughest leagues in the country, but are just rolling through and look like an absolute buzz-saw right now. In total, they’ve lost two sets in conference play to start. An unbeaten week, a top 10 victory and some other Big Ten foes beating each other up. It was music to the ears of Minnesota in their quest for a league title. They could really make a stand if they can beat Nebraska a second time this week. Penn State made a huge jump into the top five with a statement week. Two of their losses – Minnesota and Stanford – are top three teams, and another came without Nia Reed. Reed is back now and looks to be a huge difference maker. Not to mention their phenomenal week came even without a starting middle in Kaitlyn Hord. Amazingly that was the first time since 2014 that Nebraska lost to Penn State. They fought hard, but just fell short and are now in a very tight group of Big Ten schools both in the standings and our rankings. Their second week of a three-week gauntlet continues with the toughest stretch of their season. The Fighting Illini proved that they can compete with the top in the Big Ten by going on the road to down Wisconsin. In total its their sixth ranked win. Wisconsin stumbled again in league play and couldn’t get their second win over Illinois. It’s a big week ahead with Nebraska and Iowa, who they lost to earlier, on the slate. Pittsburgh has lost just 10 sets all season long as they are the first power five team to 20 victories. A big ACC title deciding match comes this weekend against Louisville. The Longhorns were upset by Kansas, proving some of their five-set struggles (they’ve had to win half of their Big 12 matches in five, including against Oklahoma) are real. The Trojans got a ranked victory and one over a team nearly ranked (and with digits next to their name in the AVCA). They’ve now got seven wins over teams ranked in the VolleyMob Top 25 at the time of play, good for second in the country. That bump plus wins over Creighton and Florida hop them back to 10. The Gators were pushed by a good South Carolina bunch but came away with the victory nonetheless. Then they swept Alabama as it’s taken some tight wins, but the Gators remain unbeaten in the SEC. Creighton keeps the wins coming in the Big East. They’ll have to focus in on this week and not look ahead, with a meeting at Marquette coming on October 26. The Mustangs have dropped just nine sets all season, with none last week. 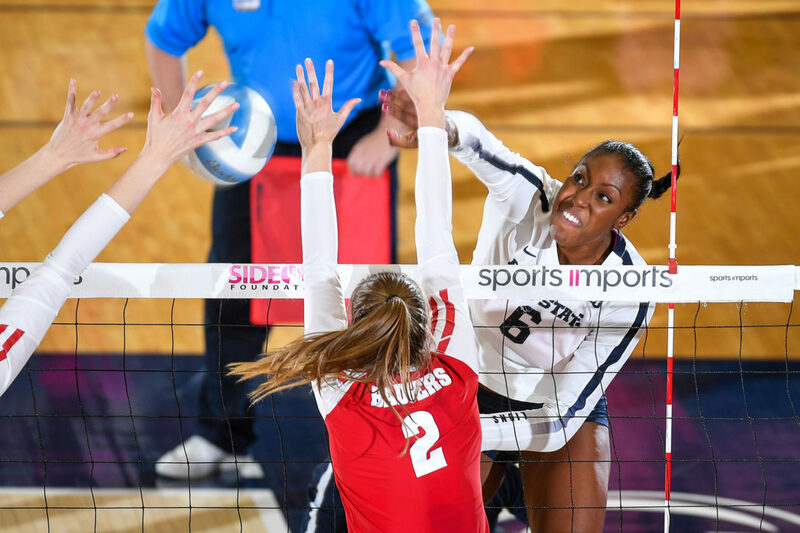 Two road tilts come at a tough time, right before they have a meeting at Hawaii in their most important conference match left. It wasn’t pretty for the Wolverines, but you’ll take two road wins any way you can, especially in the Big Ten. They’d love to repeat that this week against an even tougher slate. A week of sweeps for Marquette now leads into a match against DePaul and then likely the most important two match stretch of their regular season remaining. That starts at UNI in a non-conference meeting and then Creighton to try and tie atop the Big East. The Ducks got their third straight win by downing Colorado on the road, but couldn’t get another win in Mountain Time playing at Utah. They’ve got a big opportunity ahead this week if they can upend the Cardinal. The Huskies win at Cal shouldn’t go to the wayside, as the Bears have been pesky and they got a sweep. Then they were outclassed by Stanford, but showed strong fight in the loss. Kentucky is still undefeated in the SEC but they’re about to hit their toughest stretch of the conference season. They have three in a row on the road then home matches with Florida and South Carolina. The Jayhawks established that they are a legit contender for the Big 12 title and have won nine in a row overall. A tough road test against an in-state opponent comes next and four of their next five are on the road. The Cougars had a rough week. After a 4-2 start in the Pac-12, they lost at Stanford – not a huge deal – but followed it up with an upset loss at Cal, who has shown to be a solid team even in the bottom quarter of the league. UCLA had one of their best weeks of the season by sweeping a pair of teams from the same state and giving them nine set victories in a row. They’ll look to carry it up north in Washington. Baylor survived some injuries in the win over TCU, and now have Yossiana Pressley back to make a late stand. A one match week should only further the health of her, while Aniah Philo is also out. Purdue couldnt’ upset Penn State, but took the first set and looked ultra competitive. They then got a big end of the top 25 match-up victory over Iowa, and now have a good chance to rack up wins over the next three. The Buffaloes five losses now in the league are all to ranked teams, but unfortunately for them there are a plethora from the Pac-12 who are ranked. They’ve now got eight of their final 12 Pac-12 matches on the road too. The Hawkeyes had a big opportunity against Purdue, but couldn’t take care of business. Still, they’ve put together a team that looks to be NCAA Tournament bound. That would be further strengthened with even just one win this week.